There is something that is not being spoken of much from the pulpit anymore. We cover salvation, purity, relationships, tithing, and community pretty well but we rarely ever discuss drunkenness and drinking amongst Christians. In many denominations, drinking is normalized (a local church near me hosted an Oktoberfest event), while in other denominations it is swept under the carpet to not offend anyone. I am here to open the can of offense because I am passionate about abstinence from alcohol. A photograph I recently saw pop up on my Facebook feed reminded me of the first time I partook of alcohol. I ended up horribly sick and thrust into a world where drinking (even underage drinking) was normalized. As a twenty-one year old, the door swung even wider open because it was legal to purchase and consume alcohol in the open. Alcohol is dangerous for so many reasons…and more specifically because it impairs judgment. Most alcohol is reached for because someone wants to escape from something (regardless of what the beer and wine makers say…it isn’t the only thing that can enhance the taste of food). Men and women drink in excess to celebrate deals closing, long, stressful days, life circumstances, and nagging spouses. People call themselves “social drinkers” because they say alcohol helps them loosen up a bit. Yet, the social drinking spills over to evenings at home almost as if it serves as an adult pacifier to soothe themselves. Alcohol is a gateway to risky behavior for teenagers. (1) Scientific and social studies have proven this point. Alcohol is a leading cause behind violence, divorce, and suicide. (2) If alcohol is a gateway for these types of issues, why is the Church not doing a better job of speaking out about non-use? It saddens me when I see church leaders, Bible study teachers, volunteers, and others intentionally posting pictures about their alcohol use. It bothers me when I repeatedly see women wearing shirts that reference Jesus and wine (not in terms of the wine of communion) as their coping mechanisms. If we know alcohol to be destructive, why do we boast about it? Ephesians 5:18 says, “Do not get drunk on wine, which leads to debauchery. Instead, be filled with the Spirit.” The word “drunk” in this context means intoxicate. 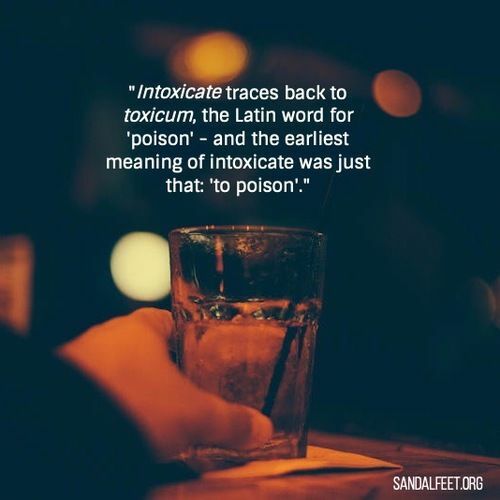 Look below to see what the Latin word for “intoxicate” originally meant. Poison. That’s what it originally meant. Something to poison your body and your mind. It wasn’t good for you then, it isn’t good for you now. Why are we continually celebrating something that alters our mind and puts us at risk? At risk to make unwise decisions; at risk to make us impaired; at risk to make us unaware; and at risk to make us numb to our surroundings, including the people around us. If we are using alcohol to escape reality, why not tap into the One who can help us survive in our reality? Ephesians 5:18 gives us the coping mechanism. It says not to be drunk with wine, but instead “be filled with the Spirit.” The Holy Spirit helps us cope and survive because it is the Holy Spirit who fills us with joy (in good and bad days), love (even when we don’t feel like loving or feel unloved), goodness (even if things around us look bad), kindness (even on our “woke up on the wrong side of the bed days”), peace (when the inner and outer turmoil rages), patience (when you really should count to one hundred instead of just ten), faithfulness (when we want to run or feel forgotten), gentleness (the opposite of pride and self-reliance), and self-control (the ability to say, “No”) (Galatians 5:22–23). Reliance upon alcohol needs to be expelled from the Church. It has no place in it nor should it be allowed to be accepted and promoted. Pastors, if you are not imbibing, tell your people why and encourage them to either not start or to stop. Pastors, if you are imbibing, ask yourselves why. Why do you feel the need to drink? Why and how did you start? Could you stop? What if the Church fasted from alcohol for seven days? What if instead of relying on that glass of wine, beer or spirits to make it through the day, your evening or that next function, people said, “No!”? What if we followed the advice of Paul and asked to be filled with the Spirit instead of filled with alcohol? How much more could our witness to the dying world be if we, in fact, started looking less like the world and blurring the lines of the secular and the saved? What if the Church radically gave every dollar it would have spent on alcohol over the seven-day period toward missions, orphans, widows or addiction ministries? And what if after the seven days the Church was freed from the binding power of alcohol because it relied on the Spirit to be filled with the Spirit? Would it be worth trying? Let’s fan the flames of the Spirit to free up some people. Even if you don’t drink, pray this for people you know and for the Church at large. Let us encourage people in the fact there is a better way to live life to its fullest. PS – For many of you, alcohol is a sensitive subject and I completely understand if you want to unfollow me or unsubscribe from this blog after reading this post. I’d ask you to wait, and pray. Spend some time in conversation with the Lord about the topic of alcohol in your life. For some of you, you are battling addiction. I pray you have help. If you don’t, I would love to hear from you and help point you to help where you might be. You are not in this alone, and you can win this battle.